Special thanks to Pauline Gower’s son Michael Fahie, for permission to quote from his biography of his mother ‘Harvest of Memories’ and from ‘Women With Wings’ and for permission to use his photographs. Eighty years ago a groundbreaking event took place in East Cowes. 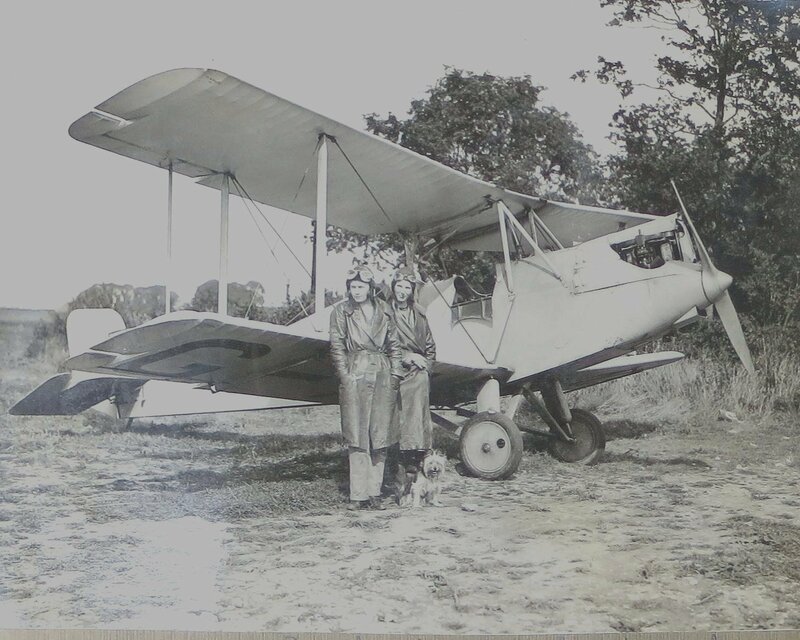 During the 1933-34 winter, hidden from view in a draughty Spartan Aircraft hanger, a lone young woman was working along side men at Saunders-Roe (SARO). She was secretly training for the Air Ministry Engineer’s certificate or ‘B’ licence. This certificate would qualify her in rigging and constructing an aircraft and to to repair and certify a aeroplane after service overhaul. Its incredible that she managed to avoid publicity, as women were barred from training at Technical Schools in this discipline. Dorothy Spicer had already gained the Ground Engineer ‘A’ in 1931, then the ‘C’ licence, at London Aero Club (LAC). 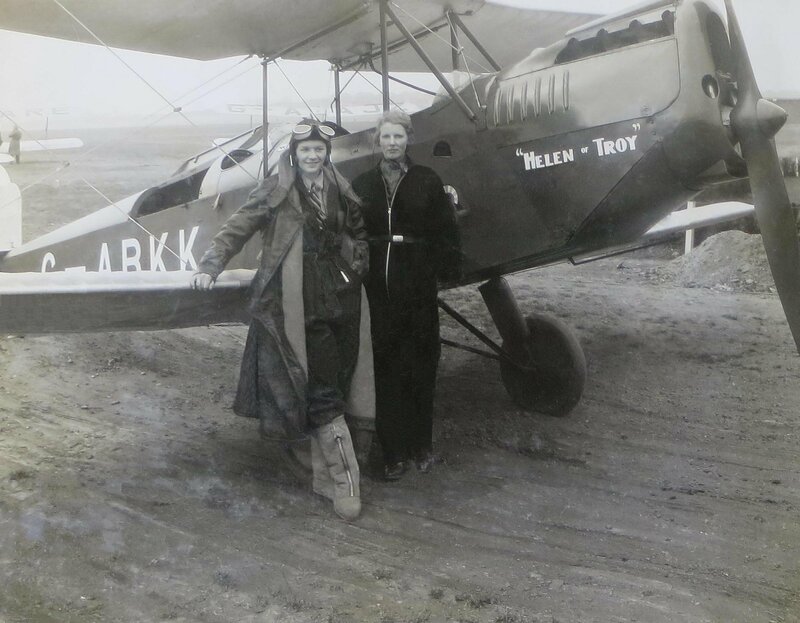 There she became friends with Britain’s heroine aviatrix, Amy Johnson. Amy had also gained ‘A’ and ‘C’ aero engineering licences at the LAC, but no woman in the UK had the ‘B’ licence. From 1931 Saunders Roe manufactured Spartan Aircraft at Cowes, with the company registered at East Cowes. Each Spartan was constructed in workshops north of Somerton Airfield. The planes were then moved by road to the airfield for flight-testing. Dorothy would have trained in the wing construction hangers. She may also have done some training in SARO East Cowes workshops. In 1934 Fred Jeans married Marjorie Maker of East Cowes. Her mother Dora ran an off-licence. Her father Edward was an aircraft fitter. In 1937 Fred was appointed chief engineer to all Whitney Straight aerodromes throughout the UK. Fred recruited John Baker to work for him. During the war, tragedy struck in May 1942 when Fred’s wife Marjorie and their 2 year old daugher, Anne Elizabeth died. Dora and Edward also perished when a German bomb hit Yarborough Road. East Cowes. Fred Jeans survived the war and become managing director of Western Airways in Somerset. John Baker worked along side him. Fred retired in 1960 due to ill health. Who would have thought that the very training Dorothy so coveted would be provided in, of all places, the Isle of Wight? Many people consider the Island to be fifty years behind mainland UK. But on this occasion the Island lead Britain and the world. 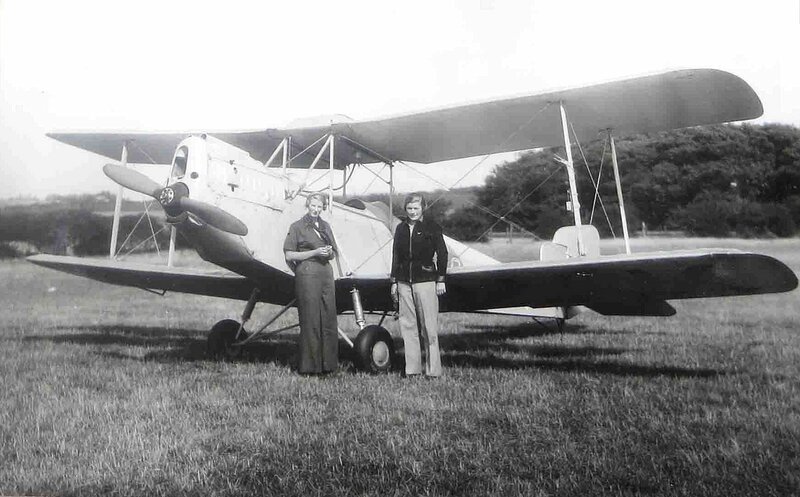 SARO helping Dorothy get her ‘B’ licence opened the door for her to progress the following year to enter Napier Engineering in Acton, London and then Cirrus Hermes works in Hull. There she gained her ‘D’ Ground Engineer’s Licence. Once again she was the only woman studying amongst several hundred men. Amid a blaze of publicity in 1935 Dorothy Spicer was hailed as setting another record. She became the first woman in the world to hold all four Air Ministry Ground Engineer’s Licences. The ‘D’ licence qualified her to certify aero engines after repair and overhaul. The news went around the globe. Saunders-Roe played its part in all this. Dorothy held the world record for a number of years. Dorothy also enjoyed the humour of the men working there. She recalled that all of her landladies during these training periods were real characters. In 1936 Alan Cobham appointed Dorothy chief engineer to British Empire Air Displays. This flying circus toured the country (touching down in Cowes). 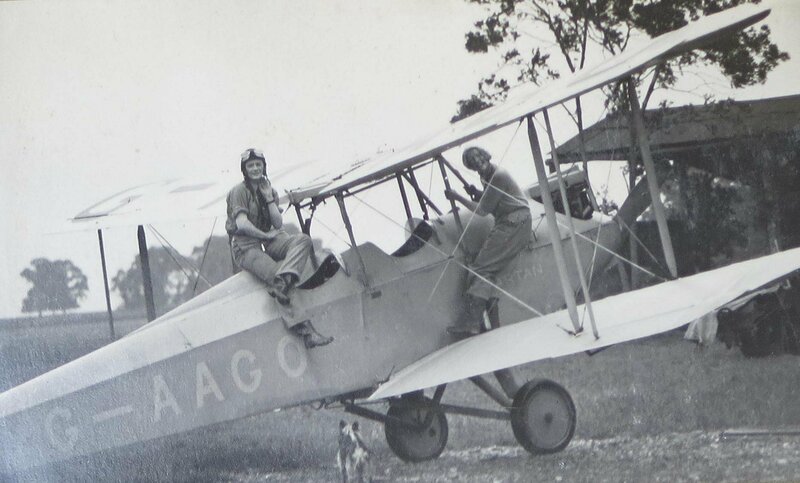 Dorothy modestly described herself as one of the ants of aviation – the little workers who stay on the ground while the butterfly pilots soar in the sky. But she then cautioned any aspiring ground engineer that when qualified, they carried an enormous responsibility – that of the safety of all who would fly in aircraft certified by them. She hoped her words wouldn’t discourage the aspirant but would instead inspire them to play an important role in aviation. After Dorothy married Richard Pearse, she was appointed to a technical post with the Air Ministry at Farnborough, in 1938. This was quite extraordinary as in the 1930s women were expected to give up work once they married. Dorothy continued in this job during the war years. Dorothy and Richard died in 1946 in an aeroplane crash near Rio de Janeiro. They were passengers travelling there to start a new life. Their daughter Patricia survived them. Dorothy’s story didn’t end there. The aviation world held her in such high regard that a Dorothy Spicer Memorial Award was created by the Society of Licenced Aircraft Engineers (SLAE) to perpetuate her memory. She was a founding member of SLAE. The impressive list of donors to the Memorial Award fund included the Spicer family, Air Registration Board, British Overseas Airways Corporation (BOAC), de Havilland Aircraft, In-Flight Refuelling, Sir Alan Cobham, Rolls-Royce, Shell and B.P Oil, Fairey Aviation, Guild of Air Pilots and Navigators (GAPAN), Percival Aircraft, Dowty, Dunlop, and from the Isle of Wight – Mr. A.C. Jack, (chief engineer of A.V.Roe), Sir Alliott Verdon-Roe and Saunders Roe Co.Ltd. The first Memorial Award Winner in 1949 was Mr.R.A.Fry, chief ground engineer of Airspeed Ltd, for his winning paper on ‘The Servicing and Maintenance of Aircraft’. The 1966 winner of the Dorothy Spicer Award was David Pettit Davies, OBE, DSC. He was chief test pilot for the Civil Aviation Authority. Davies tested aircraft from the ‘Comet’ jet airliner, to the supersonic ‘Concorde’. The 1975 Spicer Award winner was Freddie Laker of Laker Airways for “outstanding service to air safety”. He pioneered cut-price Trans-Atlantic flights in that era. Some years later the Dorothy Spicer Memorial Award ceased. This may have been when the Society of Licensed Aircraft Engineers and Technologists (SLAET) was incorporated into the Royal Aeronautical Society in 1987. The winners received a replica of the original Dorothy Spicer Memorial Trophy. Wouldn’t it be a good idea if the Isle of Wight did something to revive the Dorothy Spicer Memorial Award but in a different form? Perhaps as an apprenticeship award for young Islanders – maybe at GKN Aerospace? Or as a school prize for ‘student of the year’? Or Island Air Cadet of the year?Do you have any memories of Dorothy being at SARO? Do you have any stories handed down through your family, about her training in East Cowes? Dorothy Spicer Memorial Essay Contest established in 1949, held annually was established to further one of the ideals of the late Miss Dorothy Spicer, namely the advancement of aircraft engineering, particularly in improving airworthiness and the safe operation of aircraft. 1949 – Mr. R.A.Fry, Airspeed Ltd., chief ground engineer instructor, for his winning essay on the Servicing and Maintenance of Aircraft. 1953 – Mr.R.H.Nettell received his award from Mr. John D. Profumo M.P., Government Secretary to the Ministry of Civil Aviation. 1955 – Mr. R. A. Fry, A.R.B. surveyor, for the third time, for a paper on Inspection Aspects of Aircraft Fatigue. 1956 – F. Lindale for his Maintenance Economics and General Aviation essay. 1964 – A. S. Lucking for his contributions to air safety. 1965 – Gerald E. Ottaway, BOAC engineering supervisor, for his outstanding contribution to remedial action to correct a fault likely to endanger fleet aircraft. 1967 – F. H. Jones, Accident Investigation Section, RAE Farnborough, for his outstanding work in aircraft accident wreckage analysis. His dedicated work made valuable contributions to the practice and science of accident investigation. 1968 winner (unknown) Dorothy Spicer trophy award became bi-annual. 1969 – A. W. Fielder, of BOAC non-destructive testing, for his inspection technique of turbine blades. He was responsible for halving the overall engine in-flight failure rate with civil aircraft. 1971 – Captain Brian Powell of British Caledonian Airways for his high standard of airworthiness flight-testing. 1973 – J. M. Ramsden, Flight magazine editor, for his outstanding contribution to all aspects of flight safety, in connection with accident statistics and mandatory defect reporting. 1975 – Mr Freddie Laker of Laker Airways for outstanding service to air safety. 1977 winner (unknown) award made for an outstanding contribution to increased flight safety. Nominations were invited. Do you known of any other winners after this? Contact me.